Started building this with a buddy over labor day weekend. Made some good progress but still a bit to go. The design took an interesting change when we had everything together. In short it just seemed like the BG was not tall enough. So we improvised some tubes to raise it up. Need to really get this cabinet on some legs and then tweak the height of the BG. Hopefully in the next week or two. 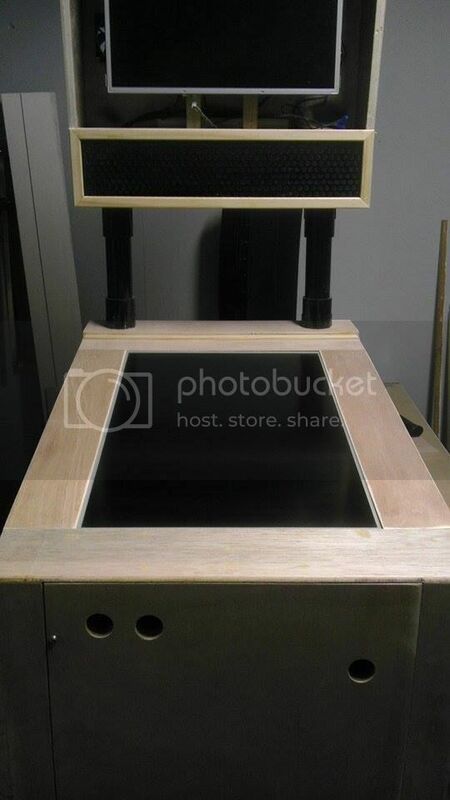 Abe working on the slider guide and trim for the speaker box, This turned out really well. 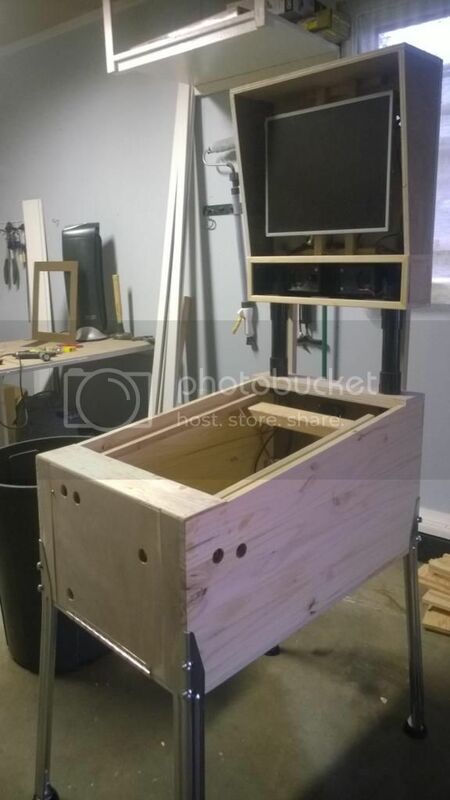 Playfield with bracing inside and few buttons drilled. 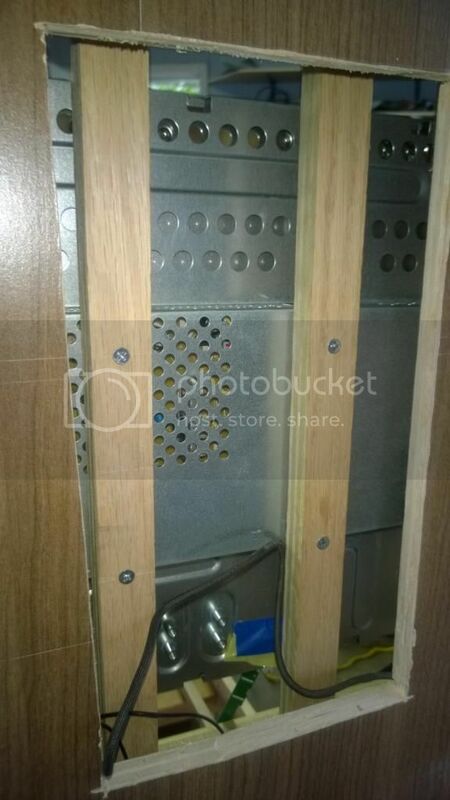 The button on the front panel in the top left are hitting a brace on the inside of the cabinet. Need to sort that. Front door will open from the front for maintenance. Closer shot of the bracing. This went surprising well also. Full shot. Not bad after about 16 hours. More to come! Edited by rtkiii, 15 October 2015 - 08:48 PM. Favorite Pinball: sttng ,addams fam.,attack from mars jurassic park,enz. nice! would keep the option of plunger in a later state open?have fun!!! Number 5 stupid name... want to be Kevin or Dave! Edited by FreeMason, 03 September 2014 - 07:00 AM. Worked on for a few hours this past Friday. Made some good progress. Wired speakers, fans, LCD cables. 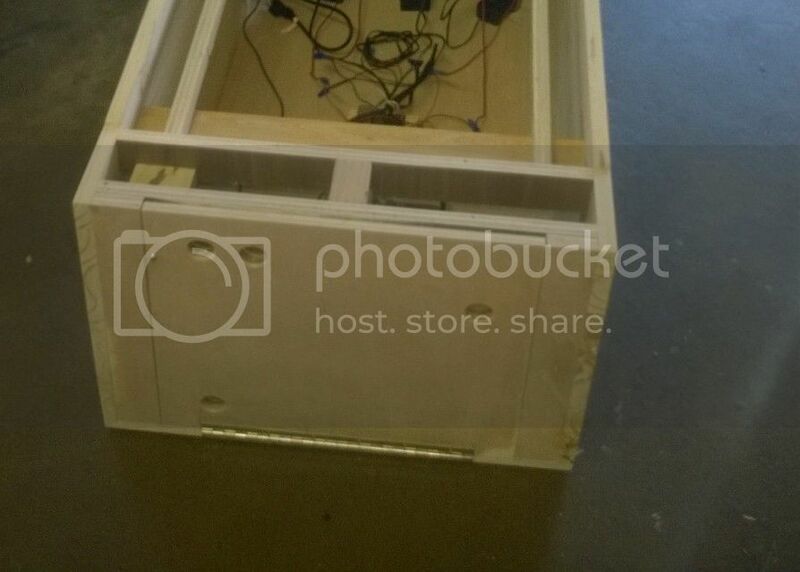 Attached audio board to main playfield box and also cut the remaining holes for the buttons. Also had to add some bracing that secured the BG to the PF a little better, we have hidden them behind the pipes. My buddy, Abe, attached the front door and latching system for easy access in the future. 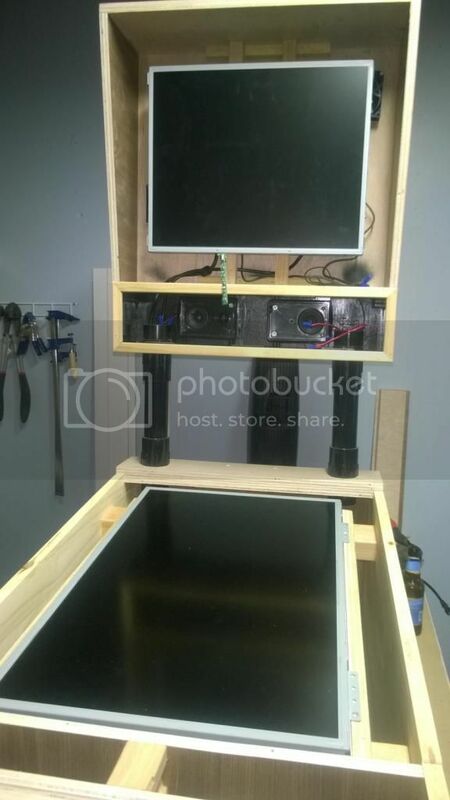 We did find an issue with our first idea for the LCD mount...which was it was a pain to mount. Ended up redesigning that and cutting a hole in the back for the BG box for easier access. Last one. 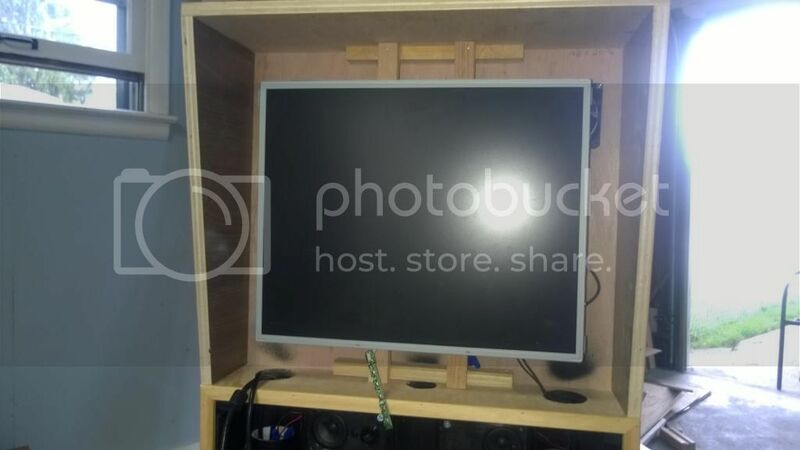 Full pic with LCDs in place. Edited by rtkiii, 07 September 2014 - 03:26 PM. Abe ended up doing the Bezel and hand rest yesterday afternoon. Looks pretty nice. We come in peace.. shoot to kill.. shoot to kill. Favorite Pinball: CCC, late 70s Gottlieb, TNA! That is a very unique, well at least to me, looking pinball machine . Very nice workmanship. Just bought the leg hardware for just under $100. More than I was expecting at the start of the build but not a bad price at all considering other sites I checked out. and considering I have spent less than $25 thus far on the build I'm ok with it. Hopefully should be here by the weekend. Edited by rtkiii, 08 September 2014 - 02:48 PM. I can see why you call it Johnny 5! After a few hours of working and beers to go along with the work we assembled the creation and my buddy went out to smoke a cig and I here him laugh. I continue to clean up the work area when he says "Dude this looks like something, I'll be curious what you see." 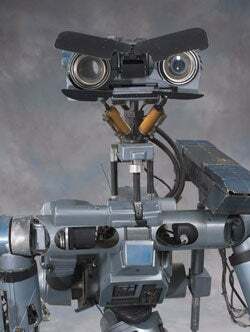 I go over and sit..."Short Circuit! - Johnny 5"
He laughs..."that was better than what I thought...I was thinking E.T." Edited by rtkiii, 09 September 2014 - 11:45 AM. 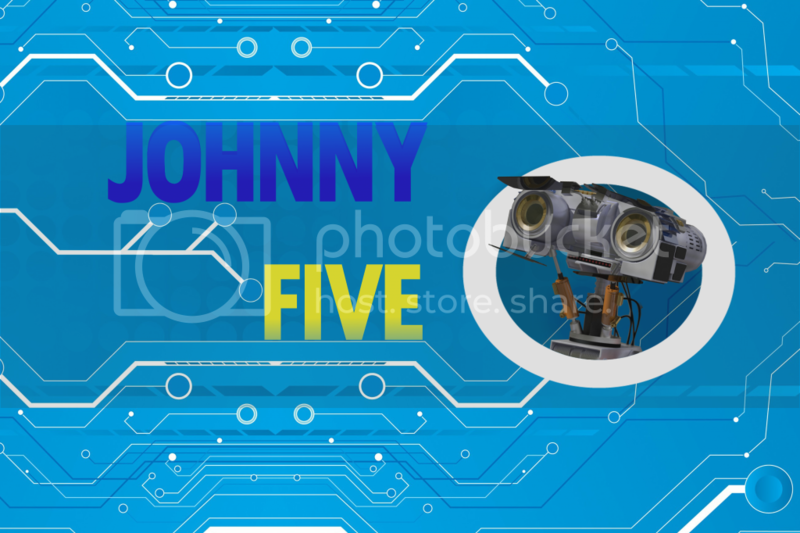 A couple ideas for the BackGlass side art and playfield side art - "Johnny Five" is the official name. BG - I need to tweak for the varied size top vs bottom but this is the main idea. And it dont have to cost you hundred and hundreds of $$$!!! I was able to wire my buttons...which is at least some progress. I like the unique design. Keep on going! Well I bought a 29" LCD on Amazon this week. which is nice since it will be 4" bigger than what I originally had in. Not sure if the "uniqueness" will stay but we will see early next week how it looks. Hopefully the mounting system does not need to change. New TV arrived but doesn't fit length wise, which I was kind of expecting. 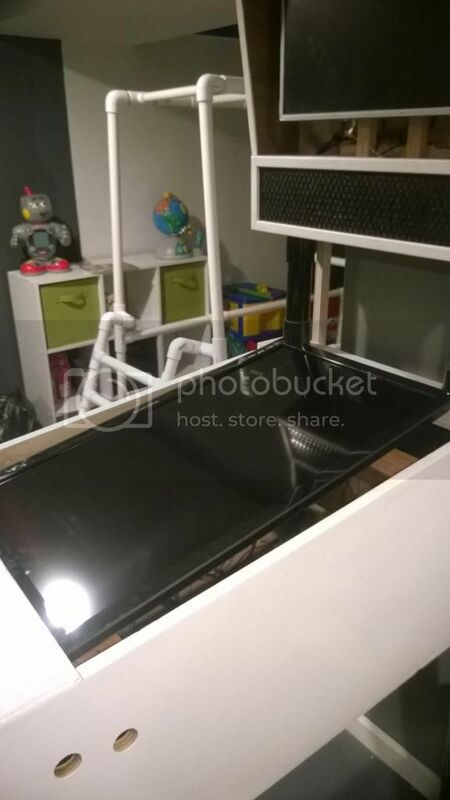 Need to redo the support inside the cabinet and adjust the hand rest some to get this to fit. Also primed and did the first coat of White paint on it.